So Pickin' Cute (Continued): Happy Halloween! Wouldn't you love to see this place restored?? It would be absolutely ahhhh-mazing. Right now it looks just creepy enough for a Halloween post. Sorry about my lack of effort in blogging lately. I really do hope you'll stick around, because eventually, I do plan on posting more frequently! What are your plans for tonight? We are going to trick-or-treat with some friends, and Kalia is going as "Snow White". She hasn't seen the movie, but that's what she chose for her costume. Unfortunately, the bottom of her dress is shredded, from jumping in a bouncy house this morning (I know - so lady-like)...so we might end up going as "Belle" instead. Enjoy your weekend, and we'll chat next week! That would make a great haunted house! That is my DREAM HOUSE!!!!!!!!!!!! 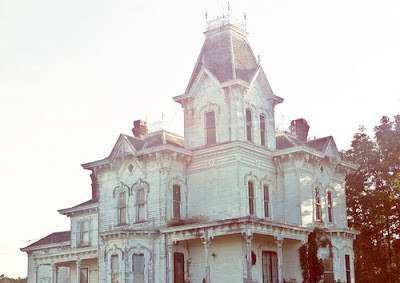 That's such a beautiful old house - could definitely use some TLC.